Setting the right dollar target for a crowdfunding campaign is a key reason our clients’ success rate is 97% (compared to the industry average of 38%). So, how do we do it? We follow these four steps. 1. We collect the pertinent information. During our first consultation with a new client, we ascertain the size of their network and any existing benefactor financial commitments. 2. We calculate the funds they stand to raise based upon the size of their network today. We crunch some numbers based on the information provided, as well as consider some industry stats. For example, the typical response to email communiques is 25% – roughly a quarter of those who receive an email about the crowdfunding campaign will participate. By contrast, the response to social media posts is only 1%! The median campaign pledge amount is $25; the average is $70. We use all these figures to calculate the range of funds the client could theoretically raise based on the size of their current network. For this sample client, the figures fell out at approximately $7,000 – $10,000 that the artist could raise from their existing network. Of course, every campaign is different, and we’d need to do a lot more digging into their network to find out how we may want to adjust the percentages. This isn’t a guarantee of how much money this artist will ultimately raise, but it is a perfect starting point for discussion. 3. We calculate how the client’s network needs to grow in order to reach the desired dollar target. This sample client’s scenario is common. Based on her current network, it would be prudent to aim for a $7,000 crowdfunding target. But, she wants to raise $30,000 to produce her project. That’s a gap of $23,000. Next, we start from the desired target and crunch the numbers backwards. 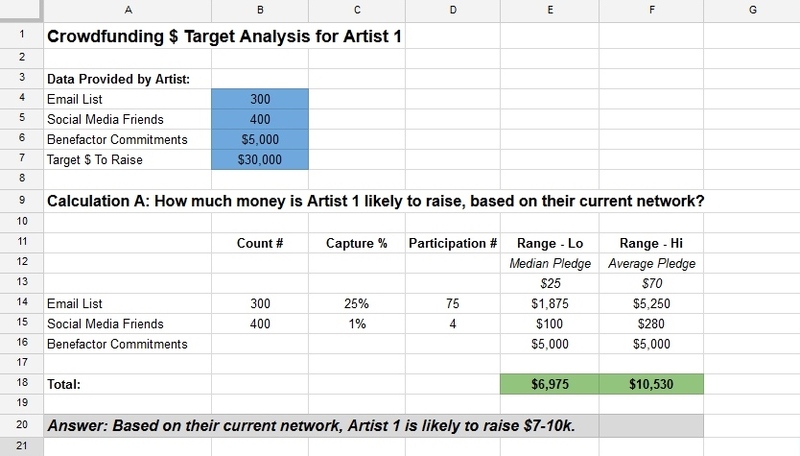 We find out how the existing network would need to grow in order for the client to hit that $30k goal. Again, every campaign is different, and this network growth would not guarantee success. But this is a great place to continue the discussion. 4. We help clients make the key decisions regarding next steps. … find an answer somewhere in between? Lots of factors influence this decision, from timing, to personality type, to who is involved on the team, and much more. We facilitate that conversation so that ultimately, our clients can set a campaign monetary target that they can achieve. 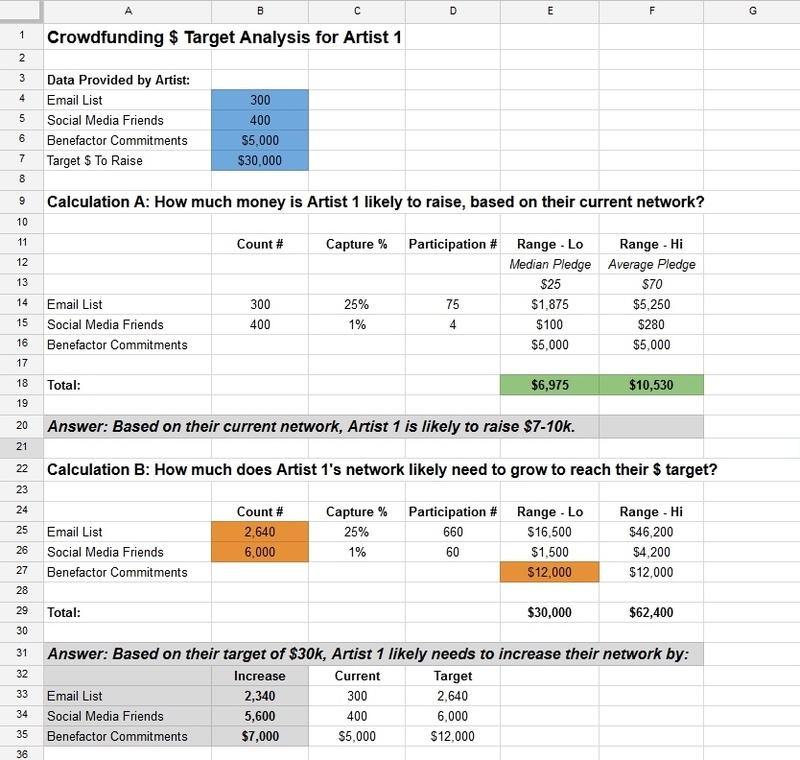 If you would like this crowdfunding $ target analysis performed for your project, please fill out our Artist Questionnaire. We typically respond within two weeks. We look forward to hearing about your project!